This July, Habitat for Humanity Choptank celebrates a quarter century of building strength, stability and self-reliance through affordable home ownership. Since its’ founding in 1992, Habitat Choptank has made home ownership possible for 72 families with only one foreclosure over the 25-year history. “The homes we build and rehab are the most visible part of our mission,” notes Charlie Bohn, president of the Habitat Choptank board of directors. The success of the mission, however, extends beyond home construction to include developing well-prepared home buyers with education, support and relationships from the first contact to that moment when the keys are handed over to the follow-through on into home ownership. 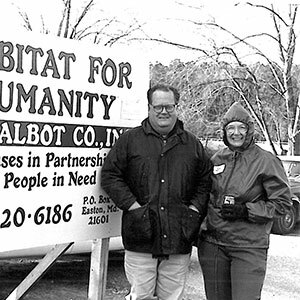 Hugh Smith (left) and Jo Merrill were founding board members for Habitat for Humanity of Talbot County. Today, the nonprofit has grown to include both Talbot and Dorchester Counties and operates under the unified name of Habitat Choptank. Cultivating new skills and getting one’s financial house in order are key elements in Habitat’s program. Each buyer, paired with a volunteer Habitat coach, attends education classes, saves thousands of dollars for costs at closing and contributes hundreds of hours of sweat equity. “Our home buyers are partners in this work,” says Charlie. 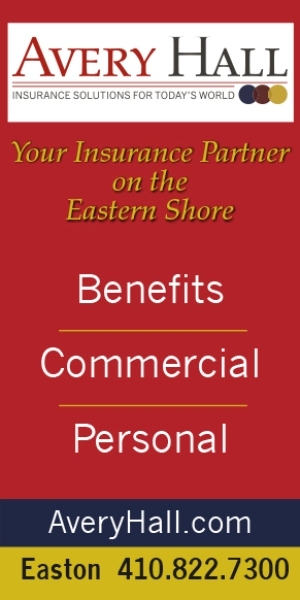 “These are individuals and families who can’t qualify for a conventional mortgage but who have the dream of home ownership.” Through an extensive application process, the future home buyers document an ability to repay an affordable mortgage for the purchase of a moderately-priced house. Habitat Choptank’s roots go back to the early 1990s when concerned citizens came together to consider the state of low-income housing within the affluence of Talbot County and to investigate alternatives. In St. Michaels, Union United Methodist Church and St. Luke’s United Methodist Church had been meeting as covenant churches. After a year of dialogue, the two churches knew they wanted to continue meeting together and decided to organize around the need for affordable housing in the town. 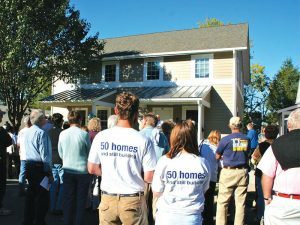 In 2010, Habitat Choptank celebrated its 50th home with the sale of a home in its 10-home development on Clay Street in Easton. Since then, the nonprofit has completed 22 more homes. Six homes are currently under construction between Easton, Cambridge and Hurlock. At the same time, Easton resident Hugh Smith was troubled about the state of substandard housing in the county. Hugh met with the St. Michaels church pastors – Reverend Ray Hopkins and Reverend Joe Henry – and participated in a series of town meetings. “Habitat was a simple idea that made inherently good sense,” Hugh recalls. “It all came together quickly and a Board of Directors was organized.” Hugh was the founding president. In 2003, he was named an emeritus member of the Board in recognition of his extraordinary contribution to the Habitat mission in Talbot County. The first Habitat home was built on Lee Street in St. Michaels. Construction began in the fall of 1992. The single-family house was dedicated in April of the next year. While its programs have expanded over the last 25 years to include rehabs and critical home repairs, the most visible part of Habitat Choptank’s mission remains home building. 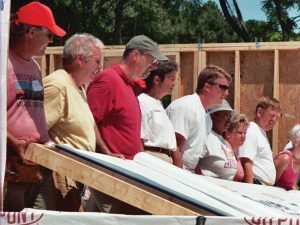 From 2005, volunteers raise interior walls on a home in Easton. Nervousness aside, the home was completed in February 2014 and purchased by Diane Satterfield. 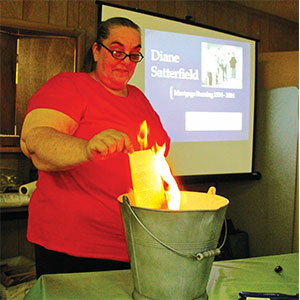 Fast forward 20 years to 2014, Habitat Choptank supporters joined with Diane to celebrate her mortgage burning. Her final mortgage payment represented another opportunity for Habitat to offer support and education. Volunteers developed a new educational workshop to help Diane and the other home owners who are beginning to pay off their notes in making sound financial and home maintenance plans for the future. 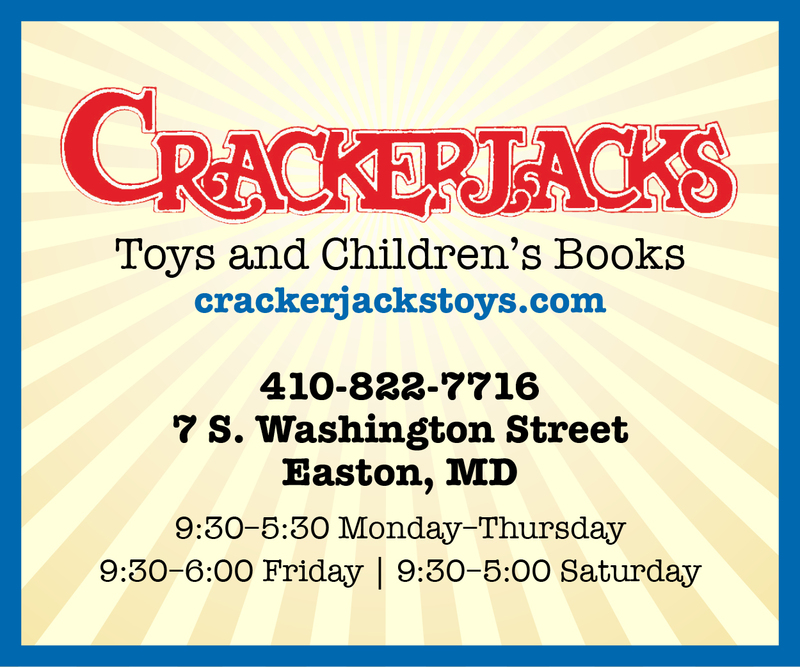 The original Talbot County Habitat affiliate has grown into a regional organization. 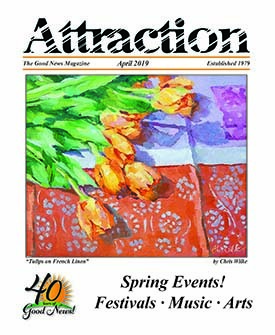 A financially autonomous Dorchester County branch of Habitat was initiated in 2004 and began building its operations under the guidance of Habitat Talbot County. Ultimately, the two groups recognized their shared mandate and joined together to include both counties under the new name Habitat for Humanity Choptank. Beyond expanding geographically, Habitat Choptank has expanded its mission. Operational capacity has increased thanks to a volunteer crew that now numbers more than 500 people annually. Currently, the nonprofit has six homes in progress between Cambridge, Hurlock and Easton with a project in St. Michaels on the near horizon. Habitat Choptank has also implemented a variety of green construction techniques to create more efficient, durable and healthier homes. The benefits of these strategies to the home owners include saving money on utilities, lower maintenance costs and a home that a family can age into. The nonprofit has expanded its toolkit of housing services, as well, to include housing repairs. In 2015, Habitat Choptank became one of 250 Neighborhood Revitalization affiliates from among the roughly 1,400 independent Habitat affiliates in the U.S. This program will assist income-qualifying home owners, many of whom are seniors, to safely and affordably stay in their homes. In just three years, 118 households have been served through this expansion. “The combination of new home ownership and services for families already living in the neighborhoods where we work helps build stronger communities,” says Charlie. In celebrating 25 years of service, it is also important to recognize there is much more to do. Housing affordability in the United States is at its worst point since experts began measuring it. In just the last 12 months, Habitat staff and volunteers have screened over 235 possible applicants, a 20% increase over the prior year. “We regularly talk to people who are working multiple jobs but can’t get ahead because they’re paying 40%, 50% or more of their monthly gross income for their housing,” says executive director Nancy Andrew, a former Habitat volunteer who joined the staff in 2009. “Opportunity needs a place to knock,” notes Nancy. There are a lot of different avenues for creating change in a community but, ultimately, if people don’t feel secure where they live, it may be impossible to promote long-term improvement. Better affordable living conditions can take a family from living day to day and create a foundation from which to make more forward-looking choices. Not every applicant is ready to make the commitment that Habitat requires. For those that are and who meet the financing requirements, partnership with Habitat can remove barriers to opportunity that may have been a part of a family’s life for years, if not generations. “Our home owners take pride in having been part of their own housing solution and that’s a powerful feeling that they can carry forward into other aspects of their lives,” adds Nancy. To learn more about Habitat Choptank, to volunteer or to make a donation, visit www.habitatchoptank.org or call 410-476-3204. In 2014, Habitat Choptank celebrated its first mortgage burning. Home owner Diane Satterfield, who purchased Habitat’s first home in Easton, joined with Habitat supporters to mark this milestone.